Chinese electronics retailer Suning opened its second unmanned store equipping full face recognition payment system in Shanghai on November 6th, Chinese media The Paper is reporting. Unmanned stores are spreading all over China, and Shanghai is becoming an important base to test the market with Shanghai’s affluent and trendy consumers. In Shanghai, unmanned convenience store BingoBox opened this year to attract local people who are lazy to go to big marts, while unmanned noodle shop just closed due to its own problems. Located at Wujiaochang (五角场) in Shanghai, adjacent to Fudan University, Suning’s unmanned shop covers area of about 100 square meters. When launching in Shanghai, Suning rebranded its store from the name “苏宁体育Biu (Suning sports)” used in Nanjing, to “苏宁易购Biu (Suning easy purchase)” The name change was mainly due to the richer product categories in Shanghai store, offering not only Suning’s Sport IP products, but also product categories from supermarket, and department stores, according to the person in charge of Suning. 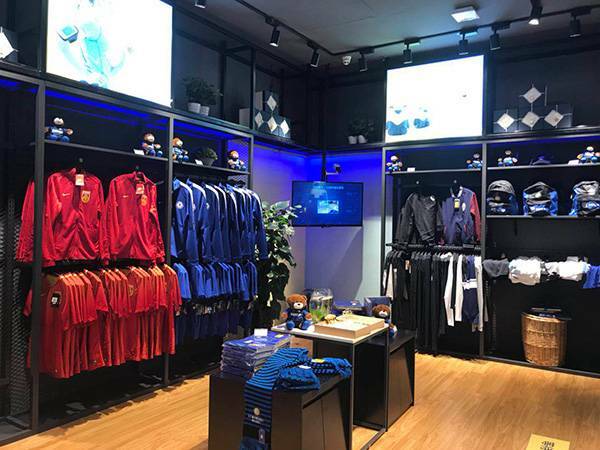 The unmanned store displays four main categories of products, including sports IP products accounting for about 70%, in addition to Suning’s lion mascot Sugelaning IP products, and furniture. From the shopping process point of view, compared to other brands of unmanned code scan into the store, Suning unmanned store equips a more simple face recognition to enter the store. Before entering the store, users download 苏宁金融 (Suning Finance) app on their mobile phone in advance, go through face recognition and link their bank card. After scanning their face, users can enter the unmanned store to start shopping. Unmanned store launch can be seen as Suning’s effort to attract tech-savvy Chinese customers to their offline stores. Last year, the retailer giant invested in online grocery delivery company Eight Days, who operates offline convenience stores on university campuses, to tap into university students. Backed by e-commerce beheboth Alibaba, Suning ranks 8th on China’s ecommerce apps annual ranking in 2016, according to Cheetah lab’s data.